Stop support ie6. It was made in 2001. Pretend like ie6 does not exist. Here at Digg, like most sites, the designers, developers, and QA engineers spend a lot of time making sure the site works in IE6, an eight-year-old browser superseded by two full releases. It consumes time that could be spent building the future of Digg. Here’s what we’re gonna do — and not do — about it. Currently, IE6 usage accounts for 10% of Digg visitors and 5% of page views on Digg. While this is down from 13% and 8% a year ago respectively, IE6 still accounts for a fairly large portion of Digg usage. 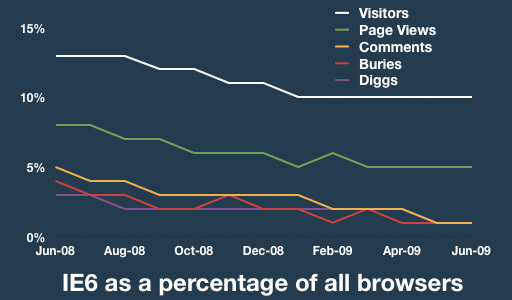 That said, a lot of time is spent by Digg engineers supporting site activity like diggs, buries, and comments in IE6, and while it accounts for 5% of site traffic, IE6 accounts for only 1% of diggs, buries, and comments. Based on the amount of activity and the relative rate of its decline, we’re likely to stop supporting IE6 for logged in activity like digging, burying, and commenting. Users of IE6 would still be able to view pages — just not logged in. This won’t happen tomorrow, but we’re thinking about doing it soon. If you have an opinion on this, hop into the comments. Should Digg prompt IE6 users to upgrade? You are currently using Internet Explorer 6. Why? 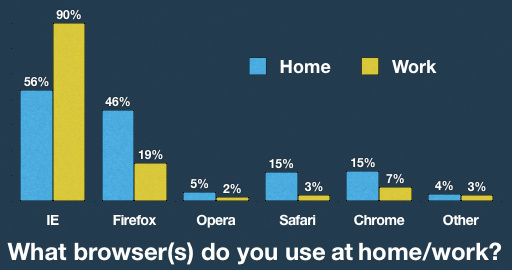 Based on the 1571 results, people use IE6 much more often at work. This goes directly to why most folks use IE6: they don’t have a choice. Three out of four IE6 users on Digg said they can’t upgrade due to some technical or workplace reason. We’re committed to developing to Web standards and building new ways to help you discover the best of the Web. Keeping an eye on what technologies folks use and why they’re being used is a big part of it.